Bringing Duke University students, researchers, and faculty together from across campus to engage in meaningful and ongoing conversation about the broader social implications of scientific and technological progress. Subscribe for Updates!Looking for Duke Conversations? S&S Dinner Dialogues are informal opportunities for students, post-doctoral fellows, researchers, and faculty from all backgrounds, to come together over donuts, dinner, or dessert to participate in engaging, probing, and timely conversation about the ethical and societal implications of scientific and technological progress. Most dialogues are hosted in the home of faculty sponsors who will lead a discussion on a topic or theme of their choice. Through these conversations, we hope to deepen the culture of responsible progress of science and technology at Duke and in the world. In order to cultivate a rich experience, attendance is limited to no more than twenty attendees and care will be taken to select participants with diverse professional and cultural backgrounds, professional interests, and areas of study. In addition, priority will be given to participants who have not attended an S&S Dinner Dialogue before and who can explain their particular interest in the topic and faculty host. Those who show interest but are not immediately selected will be placed on a waiting list and notified of any changes as the event approaches. For more information on this process, select an option from the program details menu on the right. 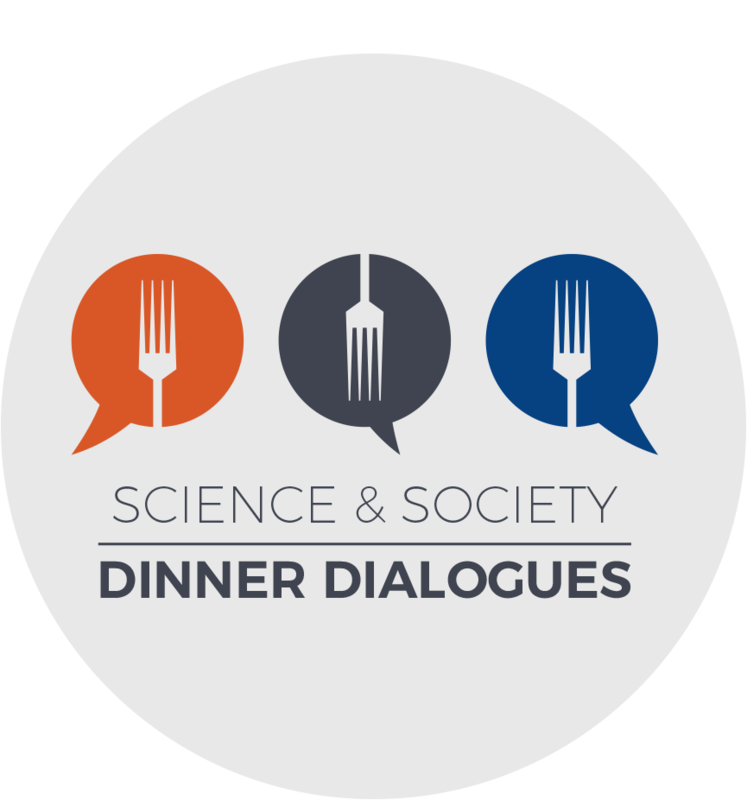 Join us and help lead the way toward better integration of ethics and policy into scientific and technological progress in society through these upcoming dinner conversation! Some scheduled events are not yet available for attendance requests. Those that are will have an RSVP icon linking off to a page with more details. Check back often as we continue to update the series with over 60 dialogue opportunities! Join Dr. Sonke Johnsen to discuss how our sense of self-worth and our ability to pursue our personal dreams has been transformed by this ubiquitous technology. In this science and society dialogue, we will discuss the potential impact VR can have in serious application areas, ranging from learning and education to the advancement of a wide range of fields, such as health care, public safety and the humanities. Dean Stephen Nowicki What can birds really tell us about humans? Stephen Nowicki, Duke’s Dean of Undergraduate Education, addressed the Class of 2020 during convocation. In a world where more information flows than we can ever successfully navigate, is it even possible to sift through it to know what is true and relevant to the choices we must make as citizens? In this Dinner Dialogue, we will explore the question of privacy through the lens of game theory–discussing not just the coming upheaval in the digital economy but the intertwined impact of changing social relationships, scientific innovation, and government action. Dr. Permar is a physician scientist focusing on the prevention and treatment of neonatal viral infections. She leads a research laboratory investigating immune protection against vertical transmission of neonatal viral pathogens, namely HIV and cytomegalovirus (CMV). Professor Brian Hare Can understanding animals make us better people? We often assume that we are the most intelligent animals on earth. But this uni-dimensional view of intelligence has been outdated for decades. What can we learn from other animals, both in how they solve problems and their emotional intelligence, and how can this knowledge help us be better people? Can automated journalism help us battle falsehoods in American politics? And can anything help us heal the partisan divide? Artificial intelligence (AI) is beginning to be used for many life-and-death decisions —such as autonomous cars and weapons as well as criminal punishment and distribution of kidneys for transplantation. Is it immoral to leave such decisions to machines? Will AI systems or robots act in immoral or destructive ways? Will computers make morally better decisions than humans do? Can AI improve human moral judgments? We will discuss these and related questions, and I will describe how our Bass Connections research group uses a hybrid method of programming morality into artificial intelligence systems. GANs are representative of the rapidly evolving capacities of artificial intelligence and may signal the legal, regulatory, and cultural challenges that remain on the horizon. We’ll explore how GANs are different in scope, potentially different in kind, and why this matters. Why do so many older patients develop thinking and memory problems after anesthesia and surgery? What might be causing these problems? And how might we prevent them for future patients and loved ones? We all know the sweet smell of cinnamon and the tangy aftertaste of lemon. But at the molecular level, what is really happening? Why are there some certain chemicals only some humans can sense? We still don’t fully know, but Dr. Matsunami and his lab are working on the answers! Duke Research Computing Minute Marvel – Post-doc Claire de March shows how cluster computing helped her model odor molecules. The computer running your spaceship has turned homicidal; you have crash landed on a planet run by talking apes. Your little sister can read your mind; your future is revealed in the DNA sample taken moments after your birth. From space travel to time travel, from mind control to genetic manipulation, from aliens to sentient robots, no genre has more fully captured—and influenced–the relationship between important scientific discoveries and profound geopolitical and social transformations than science fiction. If you have a passion for science fiction, a curiosity about how it has sparked the scientific imagination, or just want to know more about it, let’s talk! Genome editing has made it possible to alter the genome sequences of humans, animals, insects, and plants in almost any way. This technology is being developed to correct mutations that cause genetic disease, engineer animals whose organs can be transplanted to humans, eliminate insect species that carry diseases such as malaria and zika virus, and modify plants to address world hunger. The implications for science and society are manifold. Dr. Misha Angrist Blood on the Tracks: What Does the Theranos Story Tell us About Science and Startup Culture? The dramatic rise and precipitous fall of Theranos is stuff of which movies are made (starring Jennifer Lawrence). But beyond the popcorn-worthy drama, what does Theranos teach us about innovation, science and the biotech economy? Dr. William Parker Do we really need intestinal worms to be healthy? Several underlying factors cause disturbingly high levels of inflammatory-related disease in Western society. These diseases include allergies, autoimmune conditions, digestive disorders, and a range of neuropsychiatric disorders including migraine headaches, chronic fatigue, anxiety disorders and depression. In a twist on the “hygiene hypothesis”, emerging evidence strongly points toward the loss of intestinal worms as being one of the primary factors underlying these diseases. Dr. Dori Steinberg Mobile technologies for tracking behavior – helpful or harmful? We will discuss the ethics of developing health and fitness apps that are not evidence-based, but are being used by millions of Americans. Should these apps be regulated? Should they be required to show effectiveness? Why do environmentalist, who tend to be progressive and fight against anti-immigrant policies in the political arena, suddenly embrace ‘anti-immigrant’ policies and vilify the ‘foreigner’ when it comes to animals and plants, so-called “invasive species”? Can you be a progressive and anti-racist, and at the same time be a genetic purist when it comes to the conservation of ‘natural’ populations? In this session we will talk about how to use social science and behavioral economics to design products that take into account human decision-making to help people make better decisions. In this session we will discuss the bizarre world of quantum mechanics and its applications, from theories of multi-universe to discoveries of exotic properties in materials and their technological applications. Several commercial ventures are currently planning to take humans to Mars in the near future. What are the risks and rewards of such ventures, and how should we design public policies to promote the best outcomes? Who should make these decisions? Noninvasive brain stimulation techniques have been shown to effectively modulate brain function, accelerate learning, and improve recovery. This Dinner Dialogue will address the pragmatic and ethical considerations of neurostimulation to gain a competitive advantage. Spurred on by the adoption of the Millennium Development Goals (MDGs), the global health community has achieved dramatic gains in recent decades. How well is the world equipped to take on this next generation of challenges? With the advent of precision genetic engineering to produce Genetically Modified Organisms (GMO), new strategies to potentially control insect populations are becoming easier to implement. We will discuss how insects can be genetically modified, examples of such modifications in disease control and agriculture, differences in perception of GMO by scientists and the public, and the challenges going forward. What Is Stopping the Use of Genetically Modified Insects for Disease Control? In 2003, the human genome was announced as completed. However, in reality, up to 20% of the genome remains incomplete and is excluded from the human genome assembly. We will discuss what regions were excluded, why they were considered “junk DNA”, what implications they might have for human health and disease. We will explore discussion around imagining what “health as an ecosystem” might mean. How might such a lens influence perspectives? And what might be the impact? There is currently debate about the role of research participants’ understanding in the context of informed consent for research. Do they NEED to know anything? If so, what? And at what level of detail? How does the type of study influence our answers to these questions? Just as quickly as scientists in the 50s started to uncover links between cigarettes and human disease, tobacco companies started to produce and promote their own versions of “science” to counter medical evidence. Their methods for doing this were so successful that corporations, lobbyists and interest groups have continued to employ this playbook to spin science in ways that advance their agenda, right up through today. In this Dinner Dialogue we’ll explore and discuss how the strategies developed by tobacco companies in the 50s continue to be applied in “controversial” areas of current science, such as climate change, vaccines and even evolution. Dr. Sharron Docherty Defining Quality of Life: Whose Life is it, Anyway? As medical advances have increased survival for those with previously fatal conditions, our focus has shifted from quantity to quality of life. While an objective definition of quality of life has remained elusive, some shared sense of clarity around its meaning is necessary for those who must take account when making or assisting with difficult medical decisions. US law permits secondary use of de-identified clinical data for research purposes without a patient’s knowledge or consent. But biospecimens, and genomic sequence data derived from them, are increasingly linked to clinical data in the era of genomic and precision medicine. What are the risks involved, and where should the limits lie? The S&S Dinner Dialogues is committed to selecting a new audience for each dinner composed of participants with diverse professional and cultural backgrounds, professional interests, and years and areas of study. To accomplish this goal, the program staff will offer priority to participants who have not attended an S&S dinner before and who explain their interest in the topic and the faculty host. Students, post-doctoral fellows, researchers and faculty of all backgrounds, majors, degrees, etc. are welcome to sign up. Participants accepted to a dinner after they signed up through the S&S website will be notified by the Dinner liaison at least 3 days before (and often earlier) for the dinner for which they signed up. Along with their notification of acceptance or wait-listing, students may also receive reading materials recommended by the host. In such cases, students are encouraged to read the materials and to come prepared to engage in a lively conversation. We expect that the number of interested participants will be higher than the number of seats open for each dinner. Therefore, will keep a waitlist. If seats become available after one or more accepted attendees cancel their participation, we will notify the waitlisted participants and assign the available spots in order. The S&S Dinner Dialogues have been established by the Duke Initiative for Science & Society with support from the Office of the Provost with the goal of bring undergraduate and graduate students, post-doctoral researchers, and faculty together across campus to engage in meaningful and ongoing dialogues about the broader implications for society of scientific and technological progress. Students and faculty participating in this program are expected to listen to each other’s perspectives and act with respect, cross-cultural sensitivity and an open mind. The Science & Society Dinner Dialogues Program will offer transportation to participants. 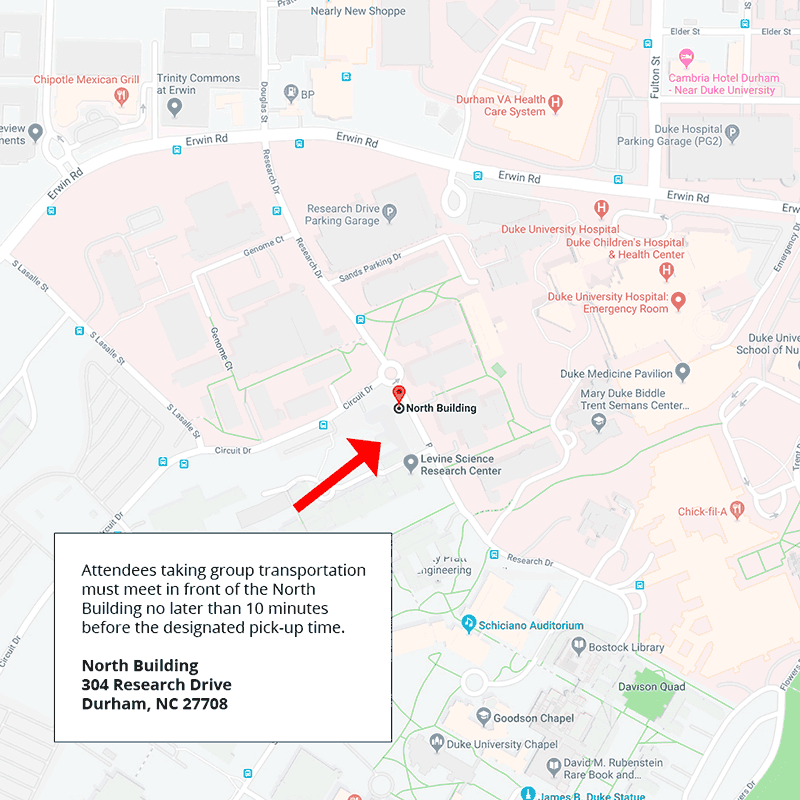 All attendees who are taking the group transportation must be in front of the North Building (located on 304 Research Drive) no later than 10 minutes before the designated pick-up time. You will be notified of the precise pick-up time, which will vary based on the distance of the host’s location. If you are late, you will be responsible for your own transportation. Participants will also be given the address of the dinner in advance, and can choose self-transporation to the event. If you unable to attend a dinner that you signed up and have been accepted to attend, you are required to give the Science & Society Dinner Dialogues Liaison member responsible for your dinner notice at least 24 hours in advance. If your notification is not received on time you may be prohibited from attending Science & Society Dinner Dialogues for the remainder of the semester. S&S Dinner Dialogues differs from Duke Conversations in that our discussions will always focus on the intersection of science, technology, and society. In addition, attendance at our events incorporates a mix of undergraduate and graduate students, postdocs, researchers, and other faculty. This can make reserving a seat difficult for high-demand events. If you are an undergraduate student and you were not able to attend your preferred Dinner Dialogue or if you are looking for additional events with more broad topics, we highly encourage you to look for opportunity in the Duke Conversations program. Visit the Duke Conversations website for more information.